MH200 series: frequency converter is V/F control with cost effective for flat load control. By adjusting the working frequency to control the speed of ac asynchronous motor. Overload Capacity 150% rated current 60s; 180% rated current 3s. Torque Limitation and Control Feature of evcavator, automatic limiation of torque during operation to prevent frequency overcurrent to stop; Closed-loop vector mode can realize torque control. Outstanding Performance With high performance current vector control technical to realize and control asynchronous and synchronous motor. Instanteous Stop Constantly In the instantaneous power fail, through load to feedback energy to make up the voltage reduce, to maintance frequency converter to keep running in a short time. Rapid Current Limiting To avoid frequency converter frequent appear overcurrent fault. Virtual I/O Five groups of virtual DIDO to realize simple logic control. Multimotor Switching Four group motor parameters, can realize four motor to switch control. one of them support Max 100Khz high speed pluse input, 2 pcs analog input terminal, 1 only support 0-10V voltage input, 1 support 0-10V voltage input or 4-20mA current input. 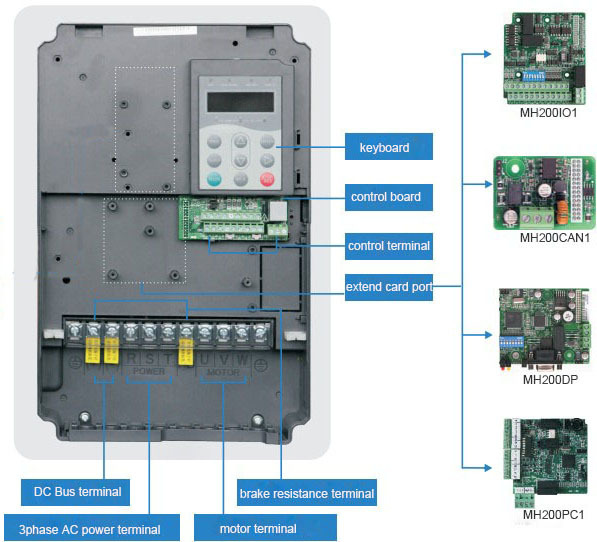 1 analog input terminal, support -10V∼10V voltage input, and support PI100/PI1000. 1 high speed pulse output terminal(can optional to be open collector type), support 0-100Khz square wave signal output. 1 analog output terminal , support 0-20mA current output or 0-10V voltage output. Frequency Source 10 frequency source: digital given, analog voltage given, analog current given, pulse given, serial port given. It can switch by many ways. Keyboard locking and function selection Realize part of key or all to lock, or define the scope part of key, to prevent the wrong operation. Using Place Indoor, not exposed to direct sunlight, dust, corrosive gas, flammable gas, fog, water, vapor, water or salt. Environment Temperature -10℃∼-40℃(environment temperature in 40℃∼50℃, please derating use. Product Components and independent air fule: strong anti-interference power mainboard in fineon IGBT module with strong overload capability; Indepent air fule prevents dustry entering and decease temperature rise. 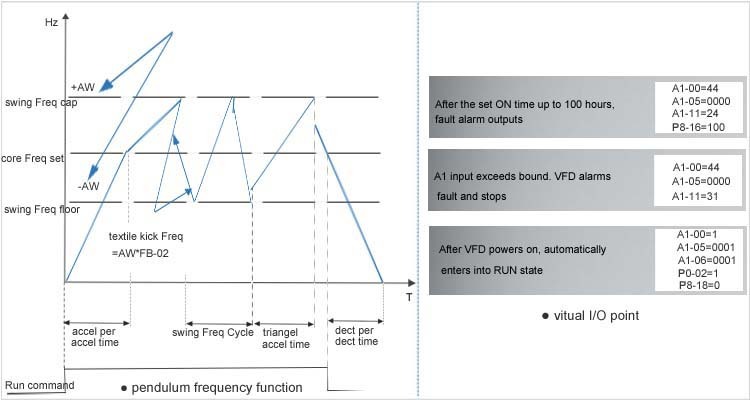 Built-in Simple PLC Function: to realize cycle operation at Max 16-segment constant time and speed. Pendulum Frequency Function &Vitual I/O: pendulum frequency function can improve coiling's densityin textile and chemical fier manufacturing industry; Through easy setting, inner logicl control function can be customized. 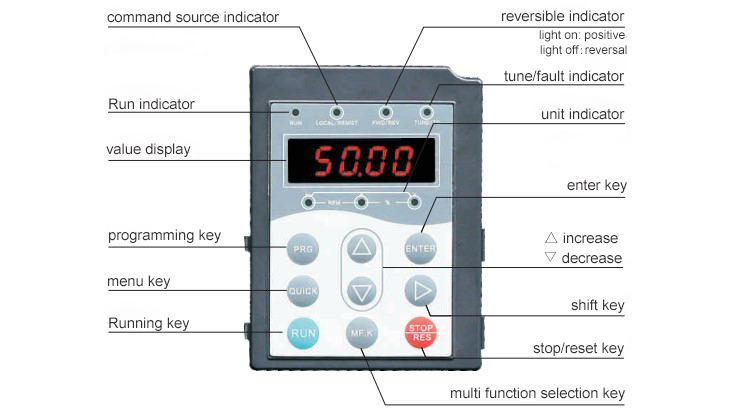 Timing Control &Instant Stop non-Stop Function: running time can set by parameters and analog; When instantly powers off or accidnetly voltage drops, frequency converter will low output speed and feedback power through load to guarantee itself run in short time. Multi-motors swtich function: it can save four pcs motor parameters, one frequency converter can be divided time to control 4pcs motor. ♥ The avaliable voltage specifications are: 3 phase 380vac input output, 3phase 220vac input output, 1phase 220vac input 3phase 220vac output. ♥ Frequency converter can not be used as voltage inverter or converter. But its input voltage can be DC(±15% DC540V for 3phase 380V devices, ±15% DC310V for 3phase 220vac devices). 1. 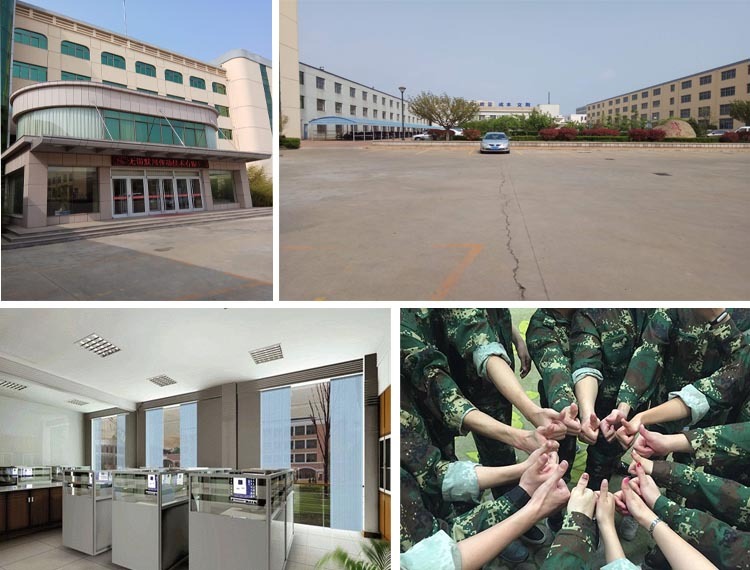 More than 15 Years' Experiece in PLC: MOCHUAN, as an integrated industrial automation products supplies, owns mature business business chain: R&D team, qualified production equipments, long-term international logistics cooperators, experienced pre-sale&after-sale engineer team to solve any problem in operating switch sensor, PLC, HMI, VFD and PMSM ac motor. Q1. What information should be provided to get a clear model with quotaion? Please directly provide input output voltage, power, applied machine, specific requested function in inquiry. Q2. They have EMC filter in the standard version? In option? EMC filter is option (under 7.5kw, EMC is bulit-in; >7.5kw, EMC filter is external). Q3. They have input DC or AC REACTOR? In option? Q4. They have a PID control? Multiple PID control references? Yes, there is one road PID control with two parameter groups, this means two different parameter setting can be configured and switched to each other. Multiple PID is multi road PID control, or multi PID control groups? Q5. What is the maximum wiring distance between the output and the motor in the standard version? Q6. What is the minimum value of the power factor? The Maximum power factor is 0.95 (the better, the bigger power factor ). But the final power factor is depens on load type and motor's power factor. 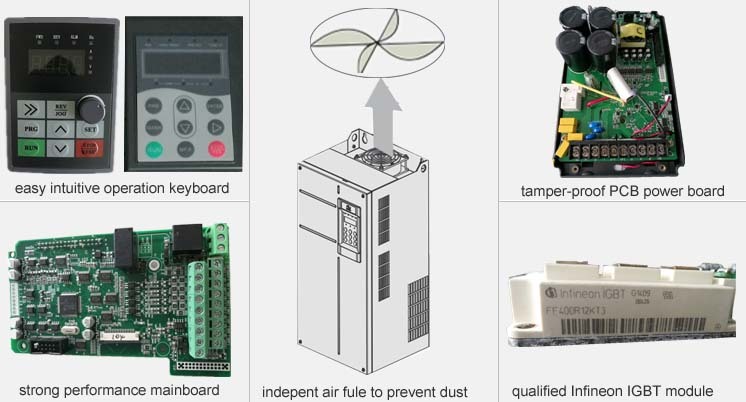 If motor's power is too little, VFD still can not make better power. 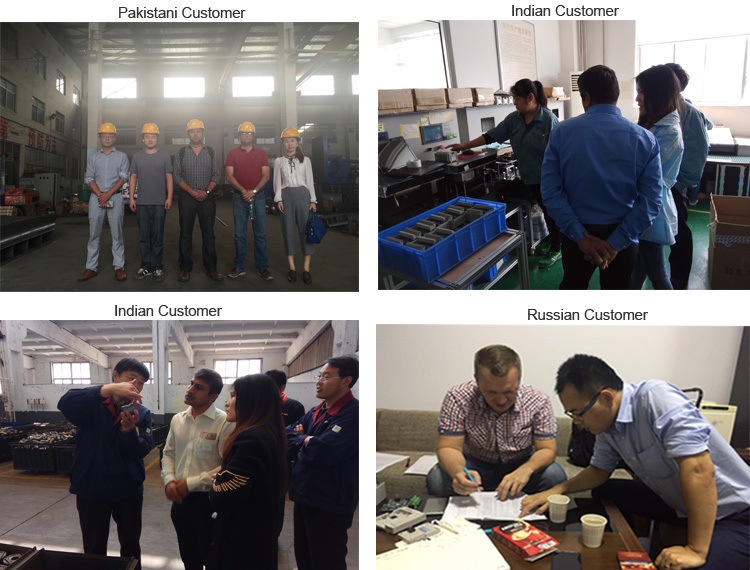 Mochuan is one manufacturer and trading company in PLC, HMI, frequency converter, importanting is one engineering company. 7days refund in case of bad quality. Free software. One-step service company. Please reply us for catagloue.